Because we believe these things, we call both ourselves and all evangelicals, as The Call goes on to say, “…to recover the historic substance of worship of Word and Table and to attend to the Christian year, which marks time according to God’s saving acts…. In a world of competing stories, we call Evangelicals to recover the truth of God’s word as the story of the world, and to make it the centerpiece of Evangelical life” (AEF Call, Points One and Four). Simply speaking, we believe about the Bible what the Bible says about itself: All Scripture is God-breathed. It is inspired by the living and unchanging God— and because its origin is divine, its truths are divine. It is alive, it is powerful, and it is authoritative. We also believe that we don’t have to “prove” the Bible, but hold that our calling as believers is to understand and live out the message of the Bible with the help of the Holy Spirit. We believe that the Bible is the record of the divine revelation of God and, as such, it points humankind to the person and work of Jesus Christ, the Word made flesh. He is the object of our worship, not the Bible, because the starting place of faith is the person and work of Jesus Christ. When people come to us from another fellowship, our hope is pastorally to assist them in discerning their call. We will seek to understand with them why they left their previous church and may encourage them to return, or direct them elsewhere, if there remains any unfinished business or unresolved sin. 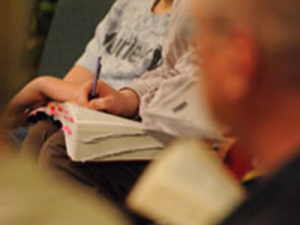 Our community of faith will never intentionally proselytize from other churches. We will also protect our community of faith from new arrivers asserting preferences for how a church ought to operate or from any unresolved woundedness or pain they may bring. “What Makes Us Ancient-Future?” An article by Pastor Chris. “Public Worship that Sings, Preaches and Enacts God’s Story: Robert Webber’s Final Call”. A 2007 “Creator Magazine” article by Pastor Chris. 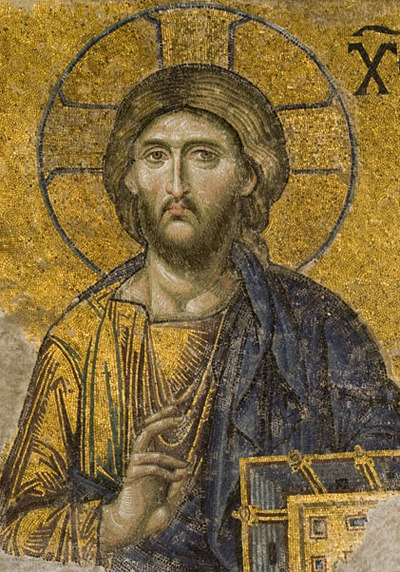 Images on this page: Top left: Christ Pantocrator (or Christ in Majesty) from the Hagia Sophia, Istanbul, date unknown. Byzantine Mosaic. Image bottom left: The Good Samaritan. 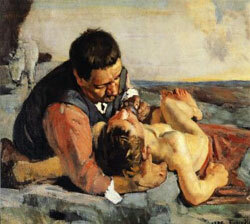 Ferdinand Hodler, 1885. Oil on canvas.